Experts at accelerated orthodontics, Smart Orthodontic Group offer several clinically proven ways to reduce orthodontic treatment time while making sure we still deliver stellar results. By staying on top of recent advances in orthodontic science and interdisciplinary dentistry, our orthodontic group is able to offer three accelerated-orthodontic treatments that can significantly shorten therapeutic timelines. Committed to non-surgical accelerated orthodontics? Willing to put daily effort into your treatment? 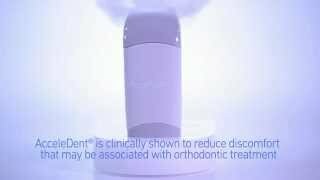 Acceledent offers an easy and gentle way to reduce treatment times by up to 40%. With gentle vibrations created by a comfortable, hands-free, oral device called the Acceledent Aura, your teeth will begin to move more quickly into the preferred position. It requires daily discipline but provides dramatic, non-surgical results for the right candidates. What is Propel and how does it work? Propel is a minimally invasive orthodontic procedure that stimulates bone growth to reduce orthodontic treatment times up to 40%. By stimulating the bone around your teeth, our orthodontists are able to harness your natural biology to enhance bone remodeling. Like our other accelerated orthodontic treatments, Propel is designed to be used in conjunction with Invisalign® or braces to dramatically reduce treatment times. Best of all, since Propel is a one-time, micro-invasive procedure, it gets you on the fast track to straighter teeth without daily maintenance. Our orthodontists are experienced at collaborating with specialists who perform an advanced surgical technique called Surgically Facilitated Orthodontic Treatment (SFOT). What is SFOT? SFOT is a dental surgery that provides targeted benefits to patients with more complex orthodontic needs and a desire for a shorter treatment timeline. How does SFOT work? The bottom line? A more functional bite and a more beautiful smile in much less time. Which accelerated orthodontic treatment plan is right for you? Our experienced orthodontists can discuss the benefits of each approach with you, keeping your needs, concerns, and goals in mind. Their goal? To empower you to decide on a path to accelerated orthodontics that's right for you.